Our Florida friends, Mark and Mercedes will arrive tomorrow for a little visit. 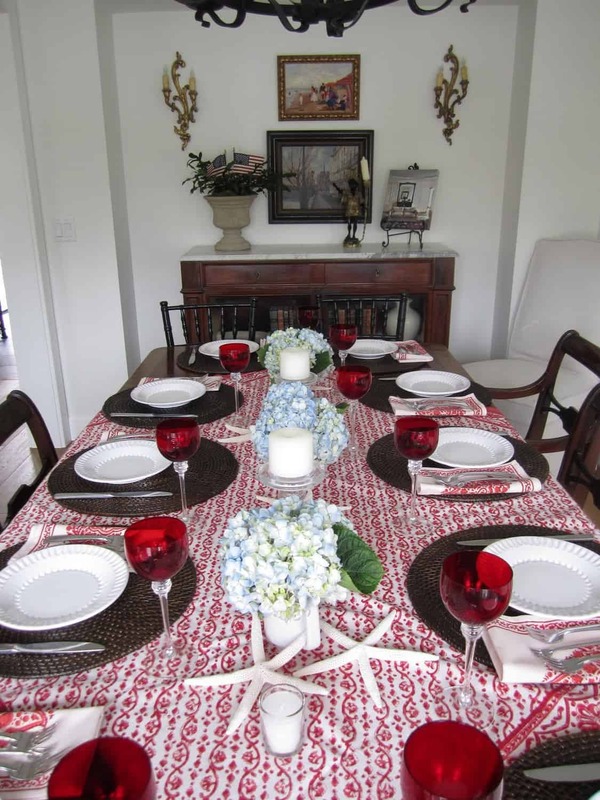 We are inviting a few friends over for a relaxed dinner. Our local friends are bringing an appetizer and a salad. Howard and I are making the Barefoot Contessa’s Clambake. We have made it several times on the Fourth of July and it is great! 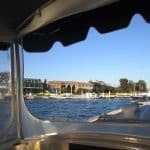 After dinner, we’ll have another friend’s dessert on the bay in an electric boat and watch the fireworks. It’s so much easier when everyone helps. I think I will make Howard pick up the seafood. I don’t want to bring back those poor live lobsters….I’ll get the corn, French bread and wine! 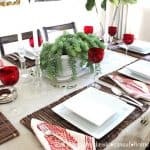 Looks like a fabulous party you're planning!! We had our celebration last night – dinner and fireworks at the beach – and lucky we had perfect weather. Not quite sure what we'll do tomorrow – I think it might just be the 2 of us since the kids all seem to have plans!! What a lovely table you've set…I love the colors. Our day started this AM. So very hot here in S. Louisiana. Temp now 103! Fireworks banned here…fear of wildfires. It is very dry and dusty! Have a great celebration and enjoy the fireworks. Hugs! 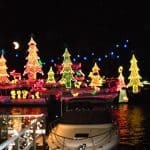 Looks like a fun evening–there's nothing to compare with watching fireworks from the water! And I love electric boats–so quiet! Your table and menu are perfect, too. Thanks so much for voting for my guy–I'll let you know how it turns out! Happy Fourth! Staying out of the horrid heat and humidity! What a nice party! Everything looks so pretty, and the menu sounds delicious! The in-laws are visiting us from New Orleans here at our Lake Cabin @ Lake Martin, Alabama. We have been boating, skiing, wake skating, and knee boarding today, but we had to come in early due to storms. That looks delicious!!! Happy Fourth! It looks like you will have a delicious celebration… one never goes wrong with Ina! We are going to a parade with our favorite little 5 year olds, and then off to the beach with them. Lots of delicious food, hopefully some sun, and most definitely great friends. what a great relaxing party you are going to have! Your table setting is lovely and your menu sounds wonderful. I'm from S. Cal also, used to work and hang out in NPB, Love it there! My family is in Yorba Linda and when I come out to visit we always hit Newport and Balboa. 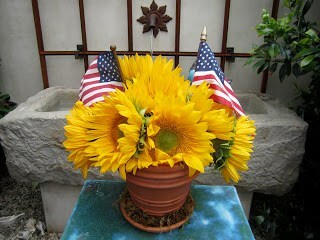 Have a great 4th, and thanks for visiting, I will be back often! your plans for the 4th sound exciting. hope you and your friends have a nice time together. fireworks on the water sound perfect. We enjoyed friends for dinner on the veranda last night with crab claws, shrimp, fresh sweet corn, caprese salad (plus avocado), and chilled California Chenin Blanc… miam-miam! Looks like a lovely party – enjoy! Sounds like a wonderfu get together! I love the idea of a clam bake… with crabs! YUMMY! Sounds like a wonderful time planned. Love a good clambake. Have a great day! What a cozy backyard and what en fun way to celebrate the weekend. Enjoy! 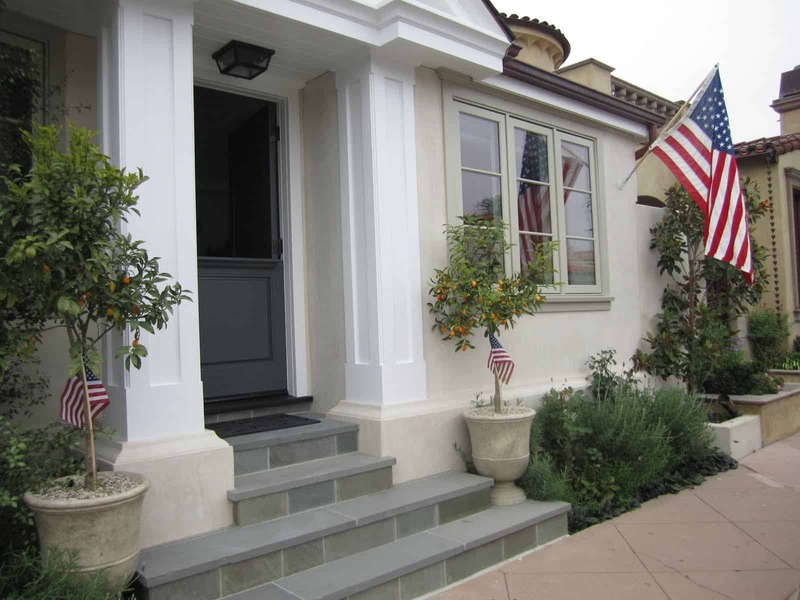 What a wonderful way to spend the fourth, and your lovely home is perfect for entertaining. Have a great day!! First- I am salivating at the scrumptuous spread. My husband is waist high in moving forward on a solid walnut wine cabinet for our family newlyweds- so we will probably hang here most of the day. Going to barbecue prime del Monico steaks and make a fresh cherry dessert for him. Diamond Bar does world class fireworks- we can see from our backyard. A happy, safe and blessed fourth to you. Your table looks beautiful! a perfect blend of beach and 4th of July! 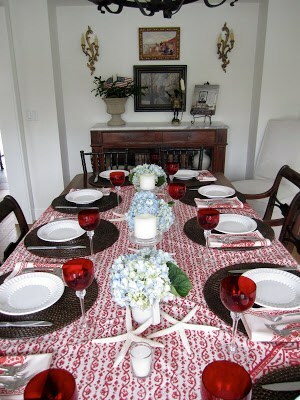 Love the blue hydrangeas and the red glasses! 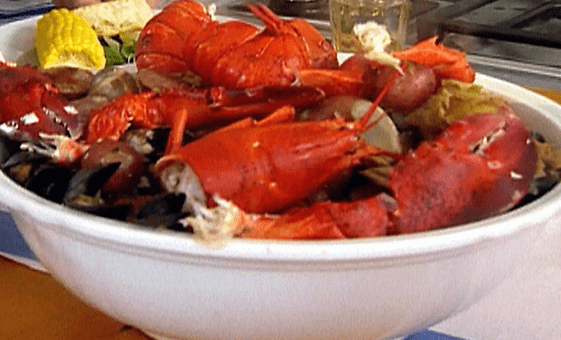 It sounds like your guests are in for a treat with a clambake! Enjoy! Your house looks perfect!! The work you did is fabulous! Have a great 4th, and enjoy that clambake! I would love to try it sometime! sounds just perfect! i love the table set up and yum- lobster! That is my kind of evening! Hope you all enjoyed yourselves!! Love the red wine glasses! Looks like a fabulous time! Hope you enjoyed it. Those lobsters look amazing. Can't believe the 4th is already gone! How are you doing? Did you have a good party? Everything looked so beautiful! I hope you guys had a great time together. I love a clambake, so delish and all american. It looks like a wonderful setting. Thanks for visiting the market! Love the lens of your camera!photography is outstanding!..hungry when seeing your delicious-clambake!Love the table settings too, gorgeous! What a beautiful table and setting! The clambake looks fabulous. I'm sure your guests felt very special! Doing a giveaway on my blog, the 8' round Flokati I used in my showhouse room! Love the set up. 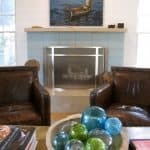 Your house is the quintessential beach house! Hope you had a successful party! Love the front of your home and your courtyard! 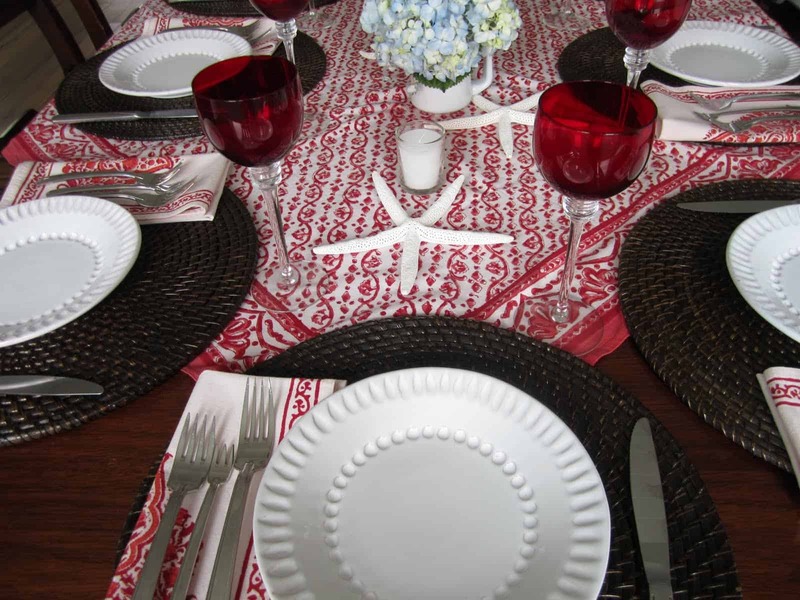 Beautiful table setting and love what you are having! Yum!! Such a pretty home you have! Cheers to California living! Wish I had been on this friend list. What a great way to share the good life. 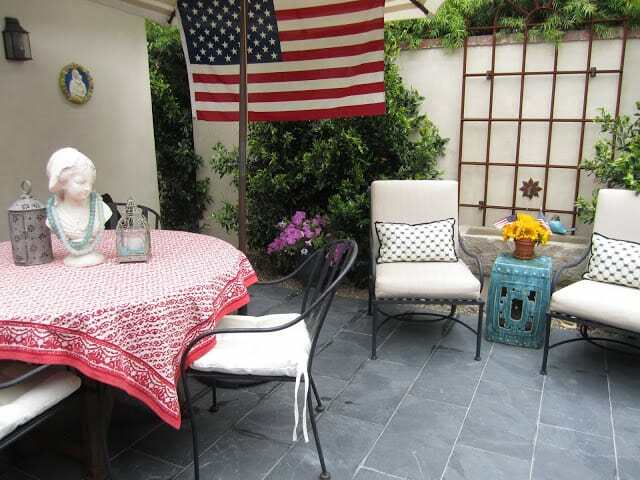 Everything looks beautiful, and it sounds like it was a wonderful way to celebrate the 4th!